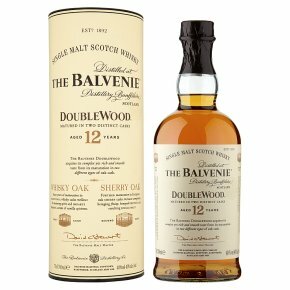 A delicate single malt from the Balvenie distillery at Dufftown on Speyside, this is first aged in oak and then in sherry wood - hence the Doublewood name. This imparts soft oloroso notes layered with honey and vanilla. Taste it and you'll pick up nuttiness, sherry and even a cinnamon flavour. To produce The Balvenie DoubleWood 12 Year Old, David Stewart MBE takes whisky that has spent at least 12 years in traditional whisky casks, American oak ex-bourbon barrels and hogsheads to mellow the maturing spirit and Impart warming layers of vanilla spiciness. He then moves it to Spanish oak ex-Oloroso sherry casks for an additional nine months to increase complexity, bringing fruity, honeyed depths to the resulting Single Malt. The whisky is then transferred to large oak vessels called ?tuns? for 3-4 months to allow the whiskies to ?marry?. This is an excellent introduction to a matured whisky for your collection and would also make a welcome gift for a loved one. Serve neat, with a dash of water or over ice.